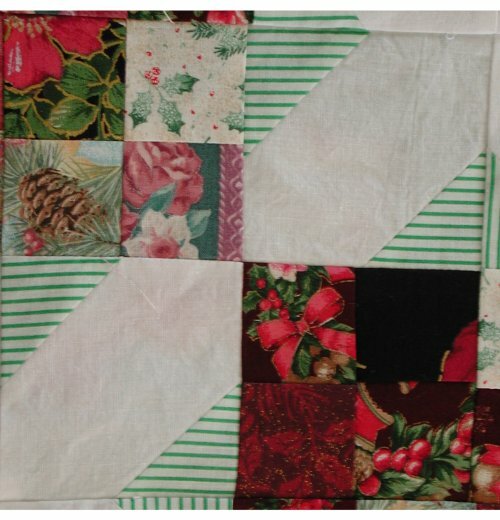 During the February 2003 Arizona Quilter's Retreat, I brought those extra 2" squares, some plain white fabric, some white/green pinstripe fabric and a layout for Arkanas Crossroads, so I could work on a new quilt (and use up some of my stash). Due to the excess fun we had at the Retreat, I was only able to make a few of the blocks and returned home with the project neatly bundled up. 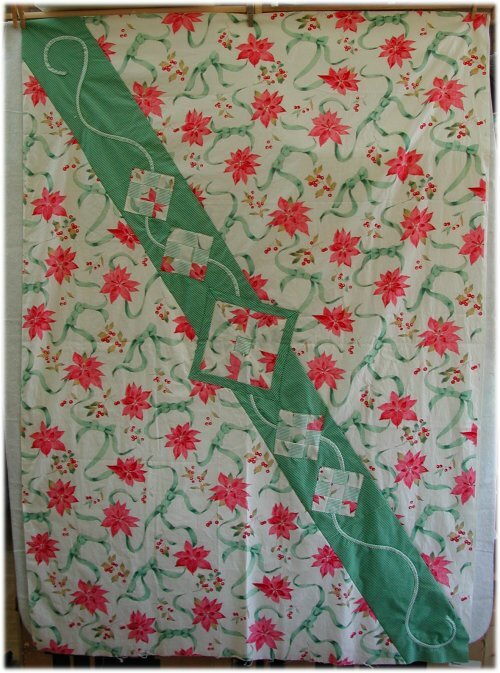 It was surprising that the design emerging for the quilt does not seem any way connected with the design of the individual block! The layout for Arkansas Crossroads came from the World Wide Quilting Page coloring book and is shown at the alternative layout link at the bottom of the page. On hand from my stash, I had plain white fabric to use in the diagonal strips, as well as the white/green pinstripe fabric that I decided would coordinate for the triangular corners of the white stripes. I also had the reverse of the pinstripe (green/white) on hand .. in fact, both were available in copious quantities, as I do have a weakness for reverse prints. Truth be told, if I remember correctly, both the pinstripes were bought so I could make a jumpsuit for my daughter, who was a toddler at the time. Ummmm.. she's now 19-1/2 and in college, so I think I kinda missed that window of opportunity. :-) Since both prints were available, I thought I might be able to incorporate them somehow. Then I got waylaid by other sewing (non-quilting) projects and other events not even vaguely connected with sewing at all ... I think it's called Real Life. :-) However, by the end of May, all my sewing obligations were complete and I was able to return to the Arkansas Crossroads project. I had almost enough of the large-scale Christmas floral print to make the backing. It would have been enough, if it had been a full 45": wide, but due to the down-sizing of fabrics, it was only 42" wide. To stretch it to fit, I put a big, ol' stripe of the reverse green/white pinstripe on the diagonal. It made the backing large enough, but boy did it look yucky. Well, maybe not *yucky* but definately not too attractive. I did have some small pieces leftover from the mitered borders of the front .. so I sewed them together to make a banded square. I had no idea what I was going to do with it, but there it was. Then I realized that I had a very small amount of floral strips left .. in fact, just enough to make 4 9-patches, using the original white/green pinstripe. So, I put the large banded square and the 4 9-patches on the big green diagonal stripe. It did look somewhat better but still unfinished. I thought that it needed something to "tie" those separate elements together, but what? Well .. I did have a LOT of the white/green pinstripe left, so I made some bias tape and used it like a ribbon underneath the squares. I used a buttonhole stitch in green thread to applique everything onto the back. While I was making this, I was wondering what I would do with it and after pondering as I was stitching, I realized that the most appropriate recipient would be my Dad's lady friend ... a lovely woman who has been my Dad's social companion for the past 10 years or so. She makes dolls (and the clothing for them) and does appreciate handmade things. Soooo ... just as soon as I get this thing sandwiched, I can start machine quilting it. I use basting spray (loooooove the stuff!) but it's been so doggone windy here lately that I can't do it outside (and I'm not about to use the spray indoors). 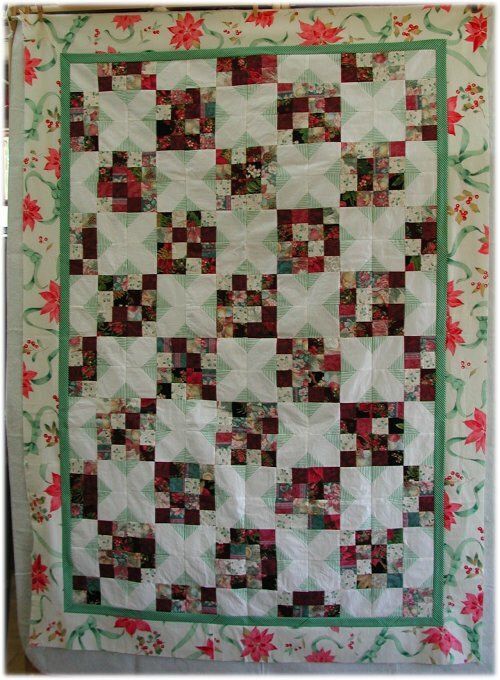 I'm thinking of doing some sort of ribbon-and-bow quilting motif, to tie in with the large scale Christmas floral fabric that is used for the outer border & backing, but I may change my mind on that one.